Tourist alert: There are a couple of big, BIG national parties coming up soon in Eastern Europe! This is due to the simple fact that both Czechoslovakia and Poland emerged at the end of the First World War -so a hundred years ago, in 1918 – from the Russian and Austria-Hungarian Empires which collapsed at the end of that conflict. Fortunately, the exact schedule is fairly spread-out (to the benefit of the hard-core partyer): Founding of the Czechoslovak State, 28 October, of the (Second) Polish Republic on 11 November. Head in that direction for some substantial celebrations, especially if you missed the last millennial party-day – no, not 1 January 2000 (although that one, too), but 1 May 2004 when these and eight other countries all became EU member-states. 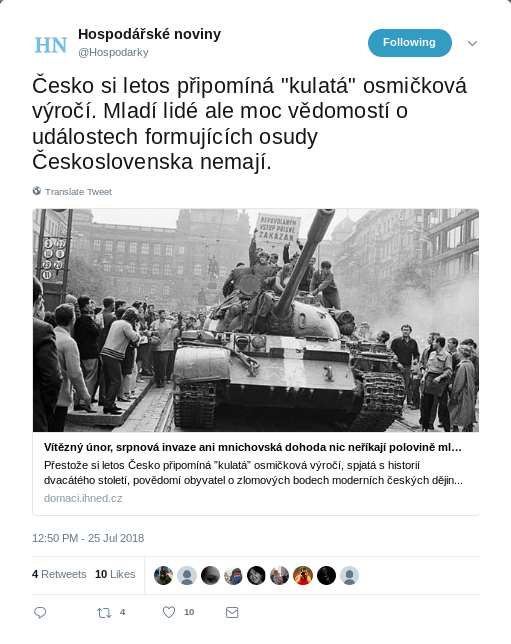 No need to study up on the exact historical occasions this time, though, for the natives likely won’t do much of that themselves, at least in the Czech Republic according to to this piece in that country’s main business newspaper Hospodářské noviny. There people o have plenty of historical milestones from recent history to remember, mostly of the sad variety. But that’s if one cares to recall them in the first place (and isn’t ignorance equivalent to bliss?). Admittedly, the 1918 (happy) events are relatively prominent in the national memory: in a recent survey, 79% could recall the end of the war and/or the establishment of the republic (not from personal experience, of course). Just twenty years later, in 1938, that republic crumbled to dust, abandoned to Nazi German forces due to the infamous Munich Agreement. But only 54% of this poll’s sample know about that. Similarly, they’re pretty up on the Warsaw Pact invasion n 1968 that put an end to a brief period of liberalization known as the Prague Spring – 76%. Rather fewer (65%) could tell the poll-takers anything intelligent about how the Communists took power in the first place, namely by means of “Victorious February” (as it was styled in Communist propaganda) a Soviet-supported take-over of the government in 1948. This poll was conducted by the NMS Market Research organization on behalf of Post Bellum, which describes itself as “a non-governmental nonprofit organization which documents the memories of witnesses of the important historical phenomenon [sic] of the 20th century and tries to pass these stories on to the broader public.” It might well be worth your time to click that previous link to read the fuller (English) description of what they try to do, or even to download their entire 24 page EN-language brochure. Crucially, Post Bellum has managed to partner with Czech Radio, and thereby has gained not only necessary equipment for recording and storing live historical testimony, but also occasional programming-slots within State radio’s various channels to present a series of documentaries, collectively titled “Stories of the 20th Century.” The webpage that brings all these together (about 90 of them) for listening/downloading is here; however, as you might well imagine, everything is in Czech. I’ve been watching coverage of this particular incident for a while, mainly via the Czech press. It has to do with an violent episode in downtown Prague last April 21 (a Saturday evening) when a group of Dutch citizens beat a waiter unconscious at a downtown sidewalk restaurant after he objected to their bringing along their own alcohol to the meal. The latest development, reported about a month ago (i.e. 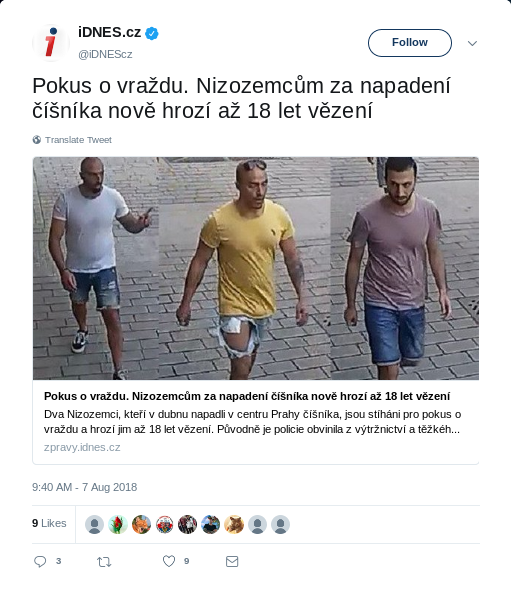 first week of August, 2018), is that two members out of that group – brothers, as it turns out – judged to have acted most violently now face attempted murder charges from Czech justice. They were a group of seven men, presumably having traveled to Prague for some “stag party”-type fun. And yes, they seized maximally the chance to display their upbringing, their courage and their sheer manhood by ganging up en masse against the sole waiter, quickly getting him on the ground and then repeatedly hitting and kicking him there, breaking his jaw and and an eye-socket and rendering him unconscious. This happened at a very public location, namely in the shadow of the Tesco department store and right by the Národní třída Metro entrance (not to mention a famous statue of the head of Franz Kafka by David Černý), and things went on in front of plenty of witnesses (and cameras) until the gang decided they needed to escape any oncoming police intervention and ran off. So we can also assume they didn’t bother paying for the meal they were in the process of consuming. Don’t worry, they were all eventually captured, and brought before Czech justice. To be clear, according to the latest Dutch coverage, of the seven perpetrators two were released without charge because of evidence that they had actually tried to calm their colleagues down rather than fight. Three others of the group were given an eight-month suspended jail sentence and deported out of the country, which they are not allowed to re-enter for the next five years (something admittedly difficult to enforce given that the Czech Republic is in the EU’s passport-free Schengen Zone). The remaining two are still jailed in Prague to this day; evidence subsequently submitted about the serious nature of the waiter’s wounds has led the Prague authorities to increase the charges agains them to attempted murder (possible 18 year jail sentence). You are currently browsing the EuroSavant weblog archives for September, 2018.